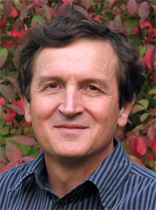 GianCarlo Moschini is a professor of economics and holds the Pioneer Endowed Chair in Science and Technology Policy. Moschini’s research at present focuses on the economics of R&D activities and the impact of new technologies, with emphasis on questions and problems affecting the agricultural and food sectors. Current projects deal with the economic analysis of biotechnology innovations in agriculture, the analysis of intellectual property rights, labeling and product quality in food markets, empirical modeling of strategic choices in contests, and the study of biofuels policies. Other research interests include demand analysis and the study of individual decisions under risk. Moschini studied at the Catholic University of Piacenza (Italy) and at the University of Guelph (Canada). He is a former editor of the American Journal of Agricultural Economics (1998-2000) and is a Fellow of the American Agricultural Economics Association (inducted in 2003). He has been at Iowa State University since 1987.